As I was talking to a client a few days ago, I realized one thing: she was spending way too much time online chatting with people she hardly knew. Her biggest complaint was needing affirmation and love. Even though she’s married and has children, she’s still lonely. Her online chat buddies fill the missing pieces of her life and make her feel important, temporarily. Though she “spends” a lot of time with them, when it’s over, she has to face the reality that they’re not really there for her. They are only there for the online version of her, which is not always an honest representation of her true self. This girl, we’ll call her ‘Candy,’ is probably one of the most popular people I know. She has over 500 friends—at least that’s what Facebook says. A large percentage of them have never met before. Others have probably only met once. And some haven’t seen each other in years. Yet, they call themselves “friends”—a term we use so loosely nowadays. If we have so many friends, then why are we living in the age of loneliness? Even with the Internet connecting so many aspects of our lives these days, we’re the most disconnected, disengaged society that we’ve ever been. So many people complain of living in isolation and feeling like they don’t belong anywhere. We enter crowded rooms, coffee shops and elevators where all you can hear is keyboard strokes because everyone is engaged on their phones and laptops. We join multiple social media sites and collect hundreds of fans, friends and followers but no real relationships. Because social media relationships are superficial. You don’t really have to care. You don’t really have to be happy all the time. In fact, you can pretend to be madly in love, rich, beautiful (all day every day), and a world class-globetrotter who’s always in the right place at the right time with the right people. You can pretend to do all the things your friends wish they could do, but can’t afford. You can pretend to ‘like’ their kids and to be happy for them when they get a promotion. All without leaving the comfort of your home. And if you get tired of pretending with your “friends”, you can always unfriend them. They probably wouldn’t notice anyway. Who wouldn’t want to be your (pretend) friend? But in real life, you have to do more than that to cultivate a genuine relationship. You have to give up time, energy and convenience if you want a real friend. You have to open your heart and feel the emotions—good, bad and ugly whenever the situation requires. You have to be honest when their shoes don’t match their dress— because that’s what real friends do! The real you has to show up, all day every day, regardless of how you look. You have to be real and share your struggles, your failures and your flaws. You have to step outside of your comfort zone. You have to let people into your heart, even when it hurts to expose what’s really in there. No more hiding behind the keyboard. If all of that sounds scary and risky, you’re right. You take a chance anytime you bet on real love and real connections. That’s why most people continue to settle for pretense, day in and day out. Facebook relationships may be easy, but they leave you feeling empty and lonely— if that’s all you have. Real connections are so worth taking a risk! Because, in exchange for all that realness, you gain someone who loves you for you. And that’s what we all want in life. We all seek affirmation, validation, and the confirmation that we matter to somebody, somewhere. My prayer for you this year is that you take off the mask, close your laptop and open your heart to new friends and new love. Use your time and energy to give to those who matter most. 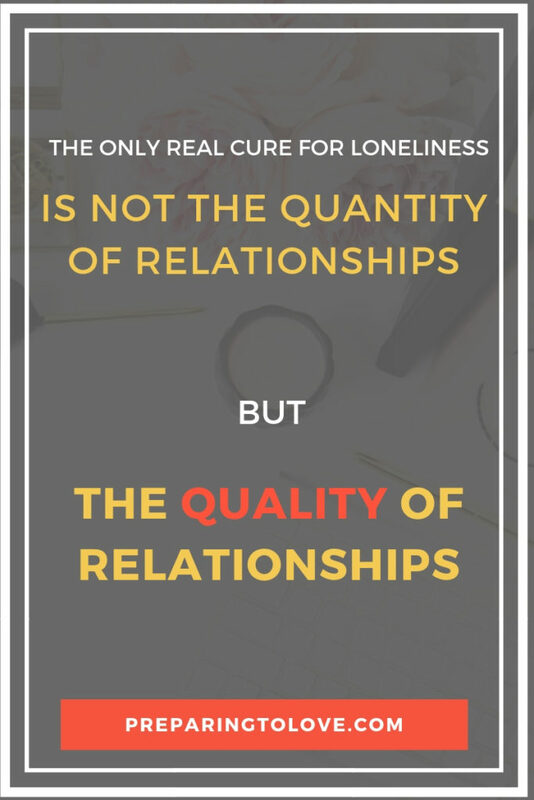 Because the only real cure for loneliness is not the quantity of relationships but the quality of relationships. So rather than choosing to engage with more people, less; choose to engage with less people, more. Choose real, authentic, fulfilling relationships over superficial, temporary validation. Pray and ask God to place those people in your life that you can be an authentic blessing to. Ask Him to help you make real connections with real people! If you want friends, show yourself friendly (Proverbs 18:24). A friend loves at all times (Proverbs 17:17). There is no greater love than to lay down one’s life for one’s friends (John 15:13).